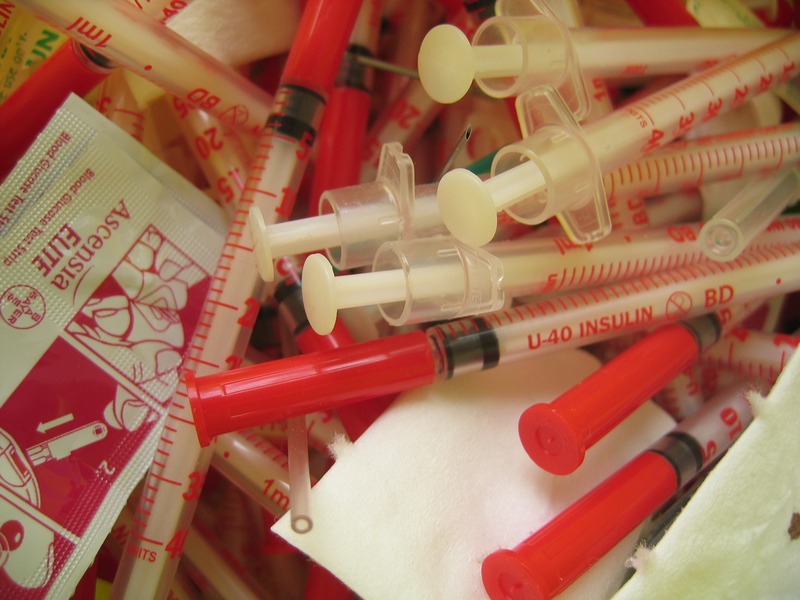 Sharps waste is regulated by state law and requires special handling. Sharps are instruments used to puncture or cut body parts. In a waste container, sharps can cause cuts, punctures and potential exposure to waste handlers. Laboratory glass and plastic waste are not technically sharps but can puncture regular waste bags and injure waste handlers. The rules for packaging and disposal of laboratory glass and plastic waste differ depending on whether or not the items are contaminated. To learn more about working safely with sharps, see Sharps Safety in Research. Sharps waste is regulated by state law and must be separated from the regular waste stream. The term “sharps” refers to items used to puncture or cut body parts. In a waste container, sharps can cause punctures, cuts and potential exposure to waste handlers. Therefore, all sharps waste must be placed in sharps containers and decontaminated prior to disposal. Use the Packaging Sharps and Lab Glass Waste poster to help identify your waste. Place sharps waste in red plastic sharps containers labeled with the biohazard symbol. Choose a container size that fits your work space; do not use a container that is too large. When the container is no more than two-thirds full, close the lid and place autoclave tape over the lid and sides without blocking the vent holes. Label with Principal Investigator (PI) name and room number. Sharps containers are available for purchase from the Chemistry Stockroom, Biochemistry Stores, or from lab/medical vendors. Sharps containers must be decontaminated prior to disposal regardless of whether the items inside are contaminated with biohazards. If a sharps container is punctured or has needles sticking out, place the entire container inside a larger sharps container; do not attempt to empty. Refer to the information on the Biohazardous Waste page for decontamination of biohazardous waste. EH&S does not collect sharps containers. Check with your department to see if a sharps disposal waste stream already exists. Place sharps contaminated with chemotherapy (chemo) or hazardous drugs in a yellow sharps container with a biohazard symbol. Do not autoclave yellow trace chemo sharps containers. Follow the instructions for packaging and disposal on the Chemotherapy and Hazardous Drugs page. Use the Sharps Waste poster for help. Place contaminated plastic pipettes and tips in a container that cannot be punctured and can be easily autoclaved, such as a pipette box/keeper. Or package contaminated items in a sturdy cardboard box lined with a biohazard bag. Label the box with the biohazard symbol and PI name and room number. Seal with “Laboratory Glass” tape. Never use cardboard boxes for sharps waste. Refer to the information on the Biohazardous Waste page for decontamination of biohazardous waste. Package nonhazardous lab glass and plastic waste items in sturdy cardboard boxes. Use any sturdy box as long as it will not weigh more than 25 pounds when full. Label boxes with PI name and room number, and seal with “Laboratory Glass” tape. Or seal the box with tape, and clearly label as “Laboratory Glass.” Boxes and tape are available in the Chemistry stockroom and from several UW vendors. Biochemistry stores also stocks lab glass tape. Nonbiohazardous lab glass is disposed of as garbage. Place the box next to your regular trash container for custodial pick-up. Do not use cardboard boxes for sharps waste, biohazardous waste, liquid waste or chemical containers that cannot be disposed of as regular solid waste. To determine if chemical contamination needs to managed as chemical waste, refer to Empty Chemical Containers. Dispose of glass and plastic contaminated with radioactive material as radioactive waste. Refer to the Radiation Safety Manual for more information. Learn to identify sharps waste vs. laboratory glass and plastic waste. Keep sharps waste separate from all other waste streams. Sharps waste and biohazardous lab glass and plastic waste must be decontaminated prior to disposal. Learn more about working safely with sharps. Treatment and disposal of sharps waste and laboratory glass and plastic waste varies based on access to autoclaves and location. Refer to the flow charts on the Biohazardous Waste page for your location for specific treatment and disposal information. Can EH&S pick up my sharps container? EH&S does not collect or treat sharps or other biohazardous waste. EH&S provides consultation and training for on-site or off-site treatment of sharps waste prior to disposal. Refer to the information on the Biohazardous Waste page for decontamination of biohazardous waste. Check with your department to see if a sharps disposal waste stream already exists. Where can I get "Laboratory Glass" tape? You can purchase Laboratory Glass tape from the Chemistry stockroom in Bagley Hall and from the Life Sciences Building stockroom in B147A. Alternatively, you can clearly label boxes as “Laboratory Glass” yourself. How do I dispose of my personal sharps such as those used for insulin injection? If your building does not have a personal sharps container, keep them in a sharps container or other rigid container, and then take all of your personal sharps home for disposal. Follow the guidance for personal sharps disposal for per your county of residence: King County, Pierce County, or Snohomish County. What should I do if I find a needle on campus? On occasion, members of the UW community may come across needles that people have left behind or were improperly disposed. DO NOT HANDLE the needle. If you are able to do so, leave a warning sign to help bring it to the attention of others who may pass by. Call EH&S at 206-221-7770. EH&S will provide guidance and coordinate with trained personnel who can safely collect and dispose of needles.